for the 2019-2020 ​​school year! Click below for application or see Admissions page. 2014-15 CALIFORNIA STATE CHAMPIONS ! Our ElectroLions Robotics Team traveled to Kentucky to compete with other top robotics teams from 27 countries around the world, celebrating their accomplishments and competing with and against the best of the best. Help support our school by mailing your donations to St. Luke Catholic School! Our Visit to Washington D.C.
A group of our students in grades 6, 7, and 8 embarked on a trip to Washington D.C. to learn about U.S. History. They visited Arlington National Cemetery, Colonial Williamsburg, Ford's Theater, Fort Magruder, Virginia, Iwo Jima Memorial, Jamestown Settlement, Korean War Veterans Memorial, Lincoln Memorial, Martin Luther King, Jr. Memorial, National Shrine of the Immaculate Conception, Mt. Vernon, National Cathedral, Pentagon City Mall, Reagan International Trade Center, Smithsonian National Air and Space Museum, U.S. Capitol, Vietnam Veterans Memorial, Washington Monument, World War II Memorial...and the White House. The students enjoyed every moment of the trip. We look forward to another adventure with our students. 2019-2020 school year. Please click on the Admissions page for more information. 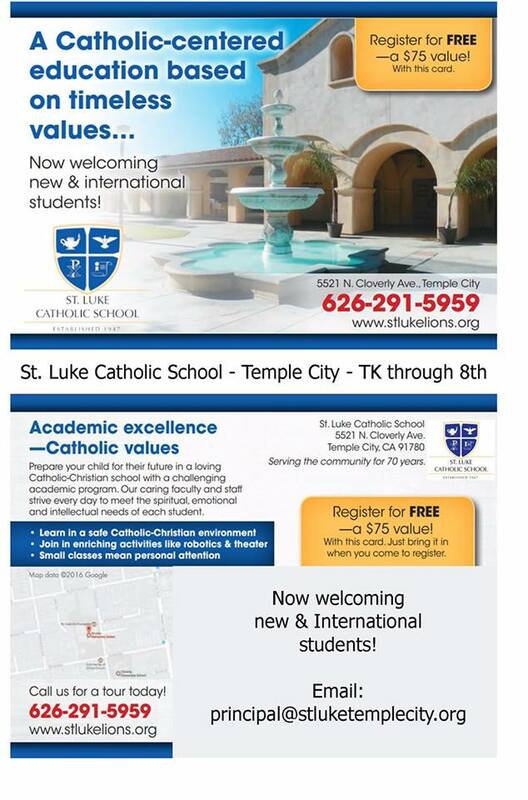 St. Luke the Evangelist Catholic School is a family community that provides a strong spiritual and academic foundation. We strive to educate the whole child. In partnership with parents, our goal is to graduate our young adults as effective witnesses of Christ in the world. the Western Association of Schools and Colleges.